We have come so far since 2015! Hello everyone! As we are coming to the end of 2016, I wanted to go over how far we've come with the new server and what is left to do. If you are just joining us, welcome! You've come at an exciting time -- we have spent the last almost-two years completely rebuilding the game to make it better, more exciting, and give the dev team more flexibility for updates. GOOD NEWS: the server has been completely rewritten and done for several months! Less-good-but-still exciting news: The client is done EXCEPT for the changes we need to make based on the bugs you guys are finding. YAY! Server's done! So... Why Isn't it Live?! 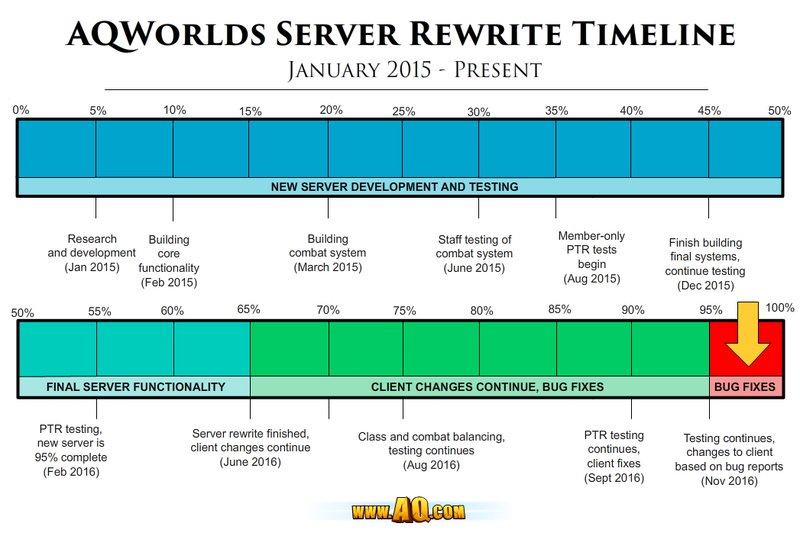 Game Server: This is the backbone of AQWorlds. It's like the engine of the car. It's what makes the game run, and you never see it in your normal, day-to-day use of the car (/game). Game Client: This is every part of the car that isn't the engine - the breaks, seats, steering wheel, etc. It's what lets you interact with AQWorlds and its server. New Game Server: This is the new, rebuilt, much more flexible game game server. New Game Client: This is the new, rebuilt, much more flexible game client, that only works with the new game server. Got that? Good! When we say "server rewrite" what we are actually talking about is a more complicated, two-piece rebuild. We have had to build both the game server AND the game client. Initially, we did not realize just HOW completely the game client would also need to change... but earlier this year, we realized that we needed to completely rebuild the game client in order to go forward with the new game server. "So why couldn't we get the server rewrite first, THEN re-do the client?" This is also a good question, and it has an easy answer! Because of how comprehensive the game server changes are, the old game client was not compatible. Using our car analogy, it would be like trying to combine an electric blender's motor with the body of a new car. They just wouldn't work together. "Ok. But this has taken a long time. Longer than you said it would!" That's very true. In the spirit of complete disclosure, we did not think it would take nearly this long to finish. Yorumi, AQW's lead coder, has had to completely rebuild the game server and client* using a language he was still gaining experience in. This was both a HUGE undertaking and a vital learning experience, but it was something we needed to do to keep AQWorlds alive. Now that we've spent so much time on it, we don't want to release something underwhelming or unfinished - that wouldn't be fair to you guys, or to the amount of time and effort the devs have put into the rebuild. What's next, and how long will it take to finish? We *need* your help to continue finding bugs, testing fixes, and rooting out any hidden issues. Our testers are AMAZING and INCREDIBLE people, but they are still only human (... for now?! O_O) and they need sleep, have real world responsibilities, and cannot be online and testing 24/7. That's why we need YOU, the many heroes of Lore, to log into Zorbak and Safiria testing servers and keep playing the game, finding bugs, and reporting them. Note: Because of how incompatible the old and new game servers are, you will experience issues bouncing back and forth between them. We are aware of this, but are focusing on fixing the new game client bugs (rather than making the old and new servers compatible) so we can release everything. Yorumi is getting married next week and we do NOT want to interrupt his special day and honeymoon afterwards. Thanks to your remarkably intense testing, in the last few weeks we've gotten more bug reports than in the first 6 months! This is AWESOME, but it does push our deadline back, so we do not have Yorumi coding at the altar. Expect another update once he has returned, but in the meantime... keep testing! That is what will help us release as bug-free a new server and client as possible. For now, HUGE /cheers to Yorumi and Mrs. Yorumi!